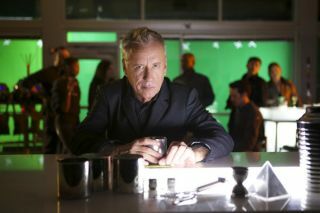 Actor James Woods in "Futurescape" on the Science Channel. Colonizing the solar system might sound like a big job, but some think that humans are destined to do it. The newest episode of "Futurescape" — a new series from the Science Channel — explores just how far humanity's reach might extend into the universe in the distant future. The episode called "Galactic Pioneers" is set to air tonight (Dec. 10), and delves into the ways that humans could leave Earth to populate other planets. Scientists working on the cutting edge of space travel and astrophysics share their views on the future of exploration in the solar system and beyond through the course of the episode. Space architect John Spencer, theoretical physicist Michio Kaku and others were interviewed for the hour-long episode. "Imagine that one day we'll be able to colonize the universe in the same way that the pioneers colonized the American west," Kaku said, summarizing the basic premise of the show during the first few minutes of the episode. "Futurescape" itself is a six-part series that extrapolates the future of humanity from technology and research currently in development. Other episodes that previously aired focused on the future of neuroscience, robotics and death. The final episode — about how to be a "superhuman" — will air on Dec. 24. "We'd sit around and brainstorm," Woods told LiveScience of the process behind developing the series in a video interview. "How about a show about robots that can vote? What about space travel — is it possible? ... Every time you think you're going on one track, something out of nowhere knocks you completely out of the box." "Futurescape" explores a broad range of implications suggested by advances in technology and science. Each episode starts off with a science fiction scenario and then works backwards to uncover how humanity could make that a reality. "Galactic Pioneers," for instance, begins with humanity as an interplanetary species, colonizing another world. "The other part of 'Futurescape' … that I really profoundly like is that not only do we deal with the science issues, but we deal with the ethical issues," Woods said. "Galactic Pioneers" premieres on the Science Channel tonight. Check local listings.